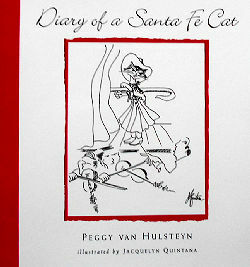 This cat book is a lighthearted look at Santa Fe through the eyes of Vanity the cat. Vanity enjoys the Santa Fe life style with a trip to a spa, serving as a docent at the Fine Arts Museum, going to the opera and finally skiing with Jean Clawed Kitty. The paper back book is 6" wide x 6 1/2" high, 96 pages, Copyright 1998, First Edition. Illustrations throughout. Previously owned but in good condition.